Now in paperback, this national bestseller is a proven, step-by-step approach that describes how, in today’s fractious, tumultuous world, your success as a leader cannot be only about achievement in your career or profession. You have to perform well in all domains of your life—work, home, community, and your private self (mind, body, and spirit) — and create harmony among these different parts over the course of your life. The good news is that, contrary to conventional wisdom about “balance,” you don’t have to assume these domains are always competing in a zero-sum game. 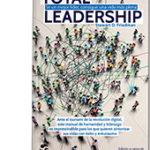 Total Leadership, now used in training and educational systems by organizations and schools world-wide, is a game-changing blueprint for how to perform well as a leader not by trading off one domain for another, but by finding mutual value among all four. It can be done! Stew Friedman shows you how to achieve these “four-way wins” as a leader who can be real, be whole, and be innovative. With engaging examples and clear instruction, Friedman provides practical tools for using these proven principles to produce stronger business results, find clearer purpose in what you do, feel more connected to the people who matter most, and generate change that is truly sustainable because it’s good for your work, and your family, and your community, and for you personally. Being real—acting with authenticity by clarifying what’s important: Understanding how crucial events in the past have shaped your values and aspirations; assessing the relative importance of work, home, community, and self; taking stock of how much attention you invest in each of these four domains; and diagnosing your satisfaction in each. Being whole—acting with integrity by respecting the whole person: Identifying the most important people in your life and their performance expectations, determining how different expectations affect one another, assessing how your use different media for connecting with these “key stakeholders,” and preparing and conducting dialogues with each one to verify assumptions and see things through their eyes. Being innovative—acting with creativity by experimenting with new solutions: After seeing both what and who are important in a fresh light, designing and implementing small, smart, potent experiments that swiftly produce better results in all four parts of life and that transform alienation, exhaustion, and resentment into feelings of purpose, authenticity, connection, and optimism. Total Leadership helped me tremendously to rediscover and reaffirm my core work values. For a journey to authenticity, this is the must-read road map for leaders and leaders-to-be. 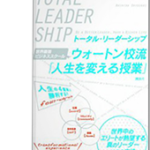 Total Leadership is a practical guide to increasing one's productivity, efficiency, and impact. Stew Friedman accomplishes something quite rare in Total Leadership. Through a combination of gripping narratives and lucid descriptions of his framework, he points the way to enduring satisfaction for executives and others by uniquely connecting the richest aspects of their lives. Across nations and industries, leaders struggle to juggle the multiple aspects of their lives and meet the demands of an ever-growing list of stakeholders. Friedman calls an end to this zero-sum game. Time and time again, I have seen his method generate a great return for individuals and their organizations. Total Leadership is a rich and satisfying call to action. Tapping into his innovative work in executive education and work/family research, Friedman teaches us how to create productive work settings that also enable satisfying personal and family lives. 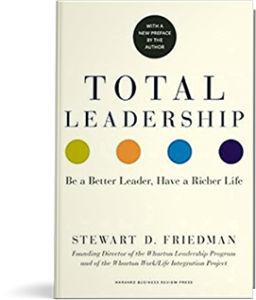 In Total Leadership Stew Friedman defines leadership in an exciting new way that can lead not only to greater success at work but also to greater success at home, in the community, and for yourself -- with each mutually reinforcing the other. Stew Friedman absolutely gets it. He is both a visionary and a much-needed advocate for a new kind of leadership in the twenty-first century. What an empowering book! Total Leadership will help you build a life, not just a résumé. Stew Friedman has written the owner’s manual for all types of leaders, young and old, who aspire to both professional success and personal fulfillment. Stew transformed my development as a leader and internet entrepreneur. 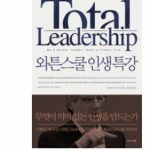 The Total Leadership book and the exercises in it are equally powerful. I’m buying a copy for everyone in my company. 2015. 20 of The Best Books by The Most Influential Thinkers in Business, Business Insider, November. 2011. The Goal is Transformation. Penn Medicine, Winter 2010/2011. 2009. 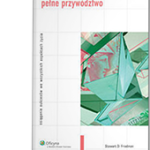 Book Review by Ariane Ollier-Malaterre. 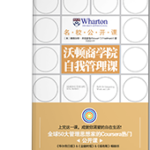 Human Resources Management, vol. 48 (4). 2009. Total Leadership. Business Plus, July/August. 2009. Total Leadership. An interview. Aish, May. 2009. A Life in Harmony. Chief Executive Officer, March 31. 2009. Managing in Troubled Times. Effective Executive, March..
2008. Be a Better Leader. Selling Power, December. 2008. Getting More of What You Want With Four Way Wins! 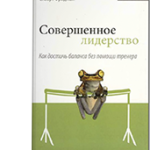 Positive Psychology News Daily, December 11. 2008. 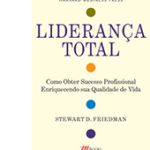 Total Leadership: An Interview with Stewart D. Friedman. Sloan Work and Family Research Network, July, vol. 10 (7). 2008. Three Minute Manager. Fortune Magazine, July 21. 2008. “Time Bind” vs. Psychological Interference and More. The Blog of Tim Ferris, June 10. 2008. Hot Ticket in B-School: Bringing Life Values to Corporate Ethics. New York Times, May 29.